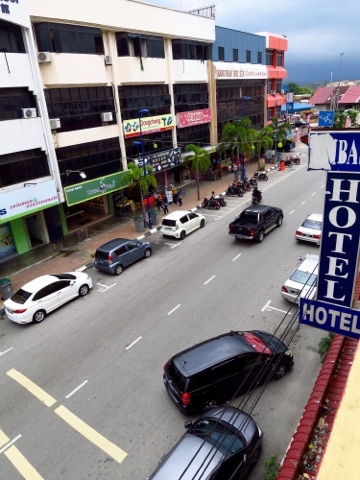 Current Location: Kota Kinabalu, Sabah, eastern Malaysia. Distance Cycled This Trip: 810km. Weather: 35 degrees C, but feels like 47 according to weather office. Judy's quotable quote as she peers into a bakery while wearing sunglasses at dusk, "I can see a woman behind the counter in that shop, or is it just a cake." 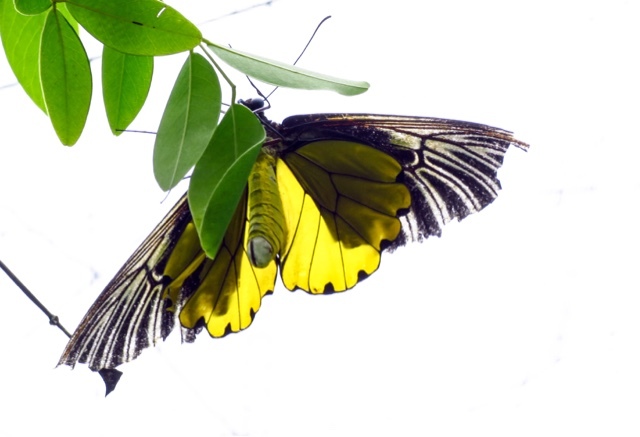 Butterfly at Poring Hot Springs, on the lower slopes of Mt Kinabalu. Keen walkers scale the 4,000m peak. We chose to spend the afternoon in the butterfly enclosure. Judy still refuses to hand over the first aid box and I am convinced there must be something in it we could discard. For example, how many packets of diarrhoea stoppers do we really need? Admittedly they don't weigh much, but every gram counts and now is the time to review what we are carrying on the tandem. We head to peninsula Malaysia on Tuesday. A small army was roped in to store our bike at the left luggage at Kota Kinabalu airport. The Left Luggage Department doubles as a frozen fish shop, inside the terminal. 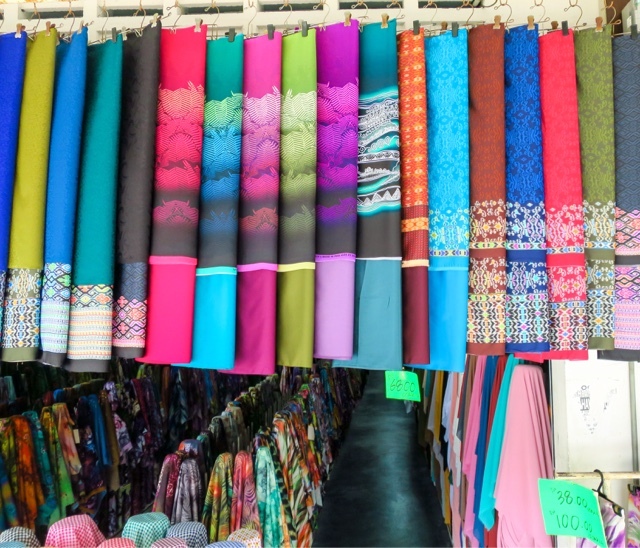 So far the pile to be posted home includes our air mattresses and a silk sheet, and some warm merino clothing we brought in case we go to the Cameron Highlands. Now we have decided that if we do go, we will just buy a couple of extra t-shirts at the time. Right now, we want weight off the bike. I am sacrificing the electric water heating device I bought in KL. It enables us to make a cup of tea first thing in the morning, but we hardly use it. It can go home. There is my Buff neck warmer (what was I thinking) and a map of eastern Malaysia that we have finished with. It may not sound a lot, but it feels a lot when we pick up the plastic bag. Loaded up and ready to leave Papar, on the road to KK. We are offloading a few things and can get rid of the small blue bag on the rear rack. There is an added benefit to lightening our load. We have made so much room in our panniers that we can dispense with the bag on the rear rack. And that helps get the bike's centre of gravity lower and make it easier to manage. Now if only I could get into that first aid box. 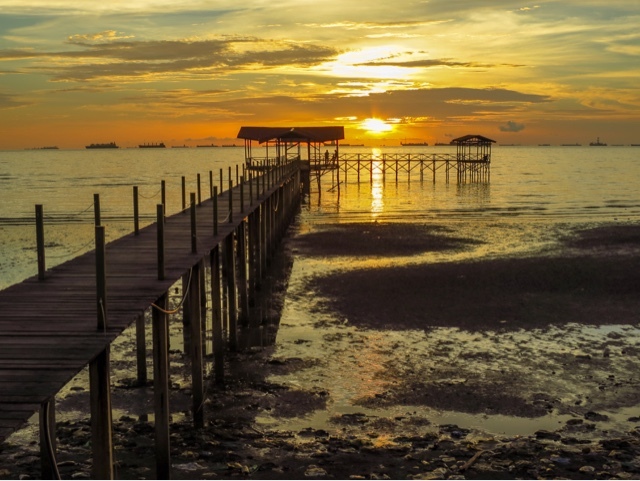 We are enjoying our time here in Kota Kinabalu, or KK as the locals call it. It's yet another town that was bombed to bits by the Allies during WW2, after the Japanese invaded. So there's not a lot character. It's a concrete jungle. Much of the downtown area is built on reclaimed land, but that's allowed room for a pleasing mixture of produce markets, hotels, a few waterfront restaurants and big shopping malls. 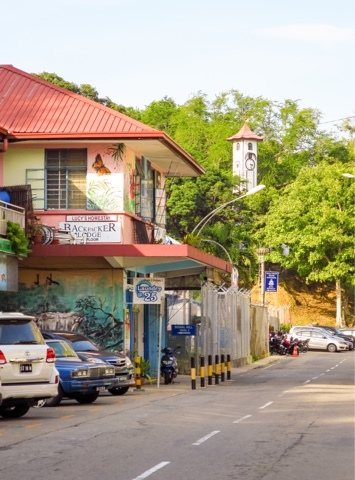 The Atkinson Clock Tower is one of the few old buildings that remains in Kota Kinabalu. 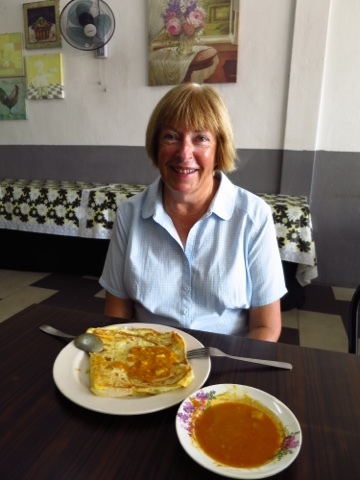 We have been resting, walking, eating and doing a few necessary chores such as booking our flights to Johor Bahru, on peninsula Malaysia, and researching our route from there on. 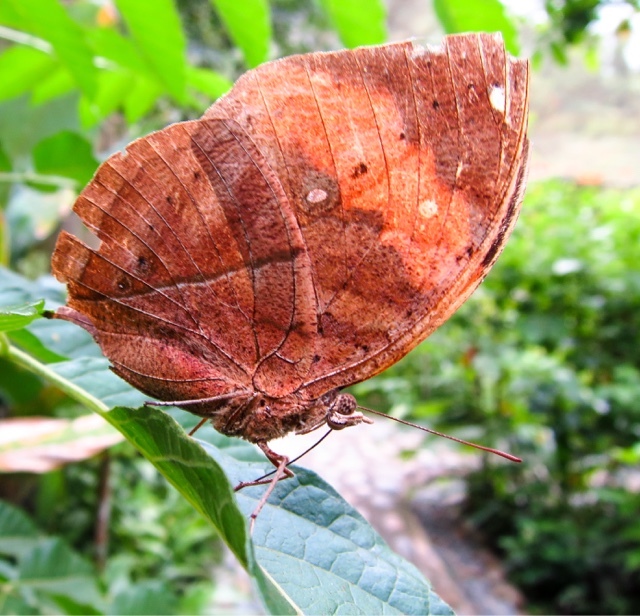 Camouflage butterfly pretending it's a leaf. 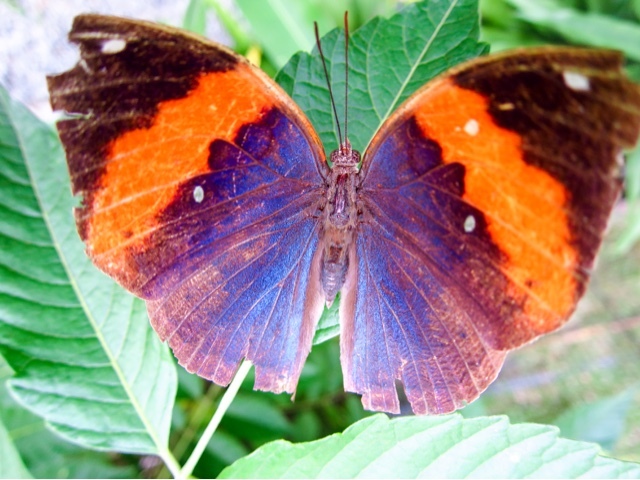 Same butterfly reconciles personality issues and displays true colours. 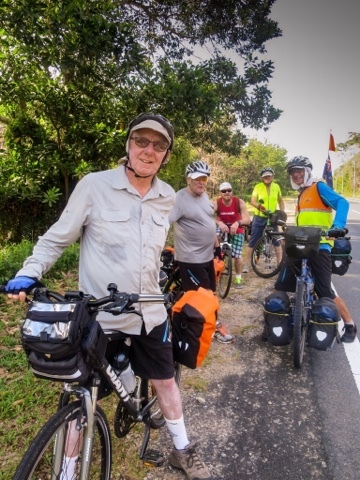 The cycling has been quite challenging, especially until we realised we were just physically incapable of doing the kilometres we had expected and reduced our daily target. 80km is the maximum for us in this heat, and several days we have only done half that. However, we are acclimatising and by setting off early in the morning before the heat builds up we are coping better as the days go by. 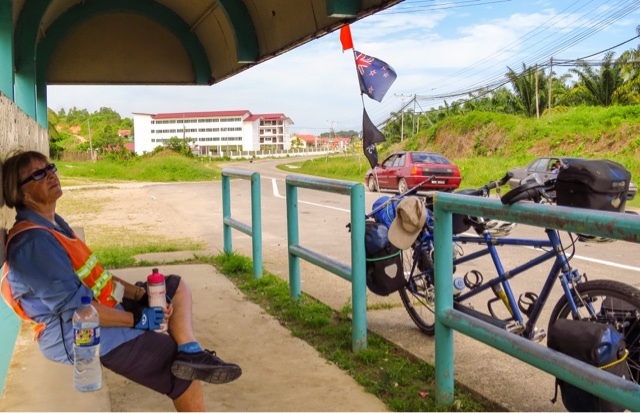 Taking a break in the shade of a bus shelter as we approach KK. 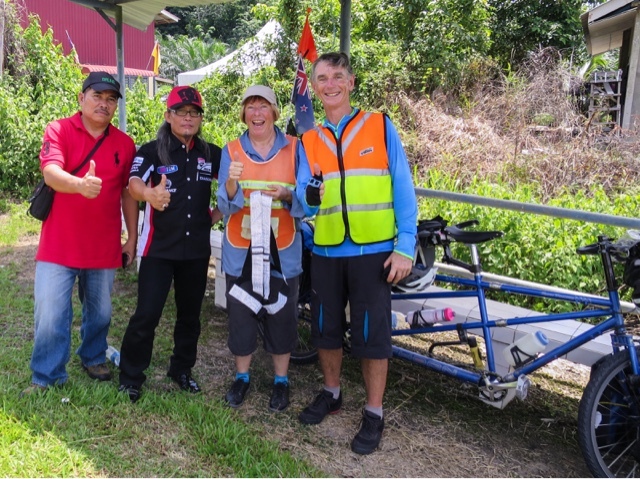 We always attract attention on the tandem and here in Malaysia there has been even more focus on us than usual. We have had offers of money, been photographed countless times by drivers who take both hands off the wheel to steady their phone cameras, been tooted at, cheered at and forced to stop by people who just want to talk. 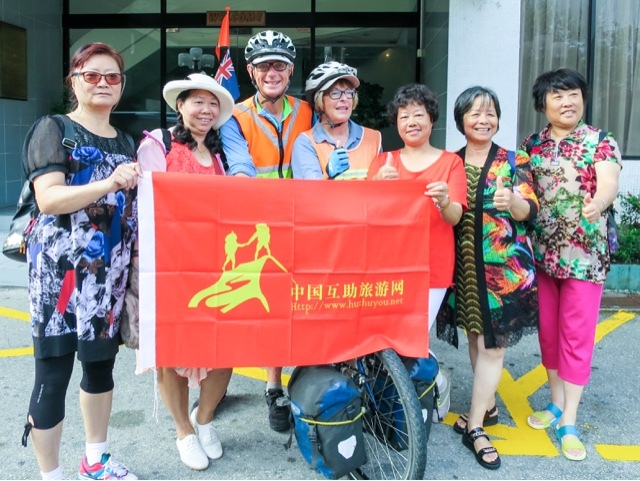 We have been interviewed by the local newspaper and Judy was given a red rose by a driver. 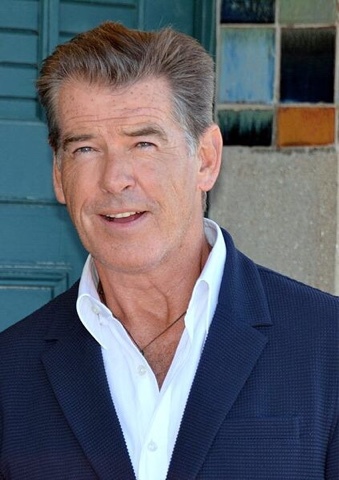 He drew alongside and stretched across to pass the rose out the passenger window, while all the time nudging us ever closer to the edge of the sealed road and the gravel. Somehow we and the rose survived. Even without the tandem, people seem to want to take our picture. Are we freaks? We have been woken before dawn by the call to prayer. In the town of Beaumont it wasn't just us. Every stray dog in the neighbourhood leapt to its feet and started yelping as if in pain. It was 4.45 am and all we could do was laugh. Sleep was impossible. We find we are laughing a lot. Today we cycled out to the airport and spent several hours in a quiet corner of the terminal packing the bike. When the job was finished we took the two boxes to the left luggage area, which is run in conjunction with a frozen fish shop in the terminal building. 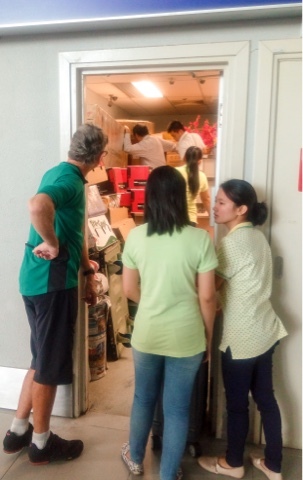 The room out the back was stacked to the top with cartons and a few items of passengers' luggage. It was hard to see where the bike would fit until the manager was called in. Two bike boxes wedged in a corner. "Can do, can do," he repeated as he threw his small army of staff at the task of making room. We counted six of them. 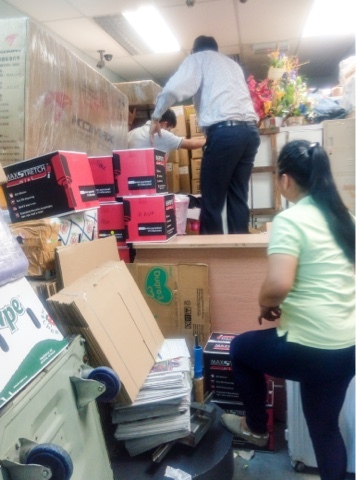 The breakthrough came when the second most senior man took one of the boxes and balancing it on his head, scrambled onto a bench and into a far corner. Clapping broke out, we shook hands all round and promised we would be back in two days. 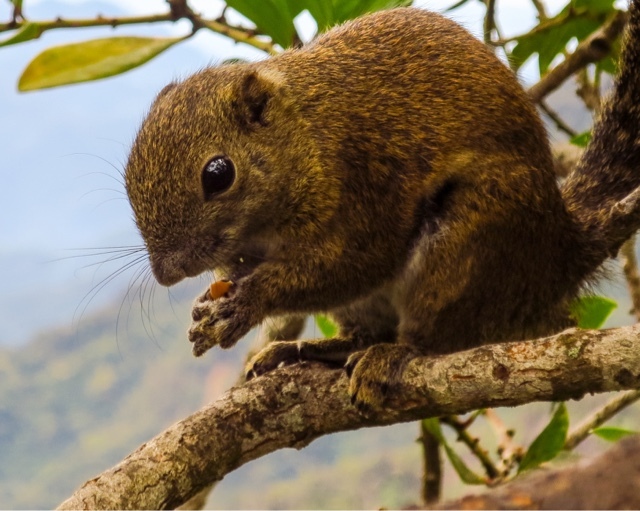 Squirrel at Mt Kinabulu Park. So tame they eat peanuts out of people's hands. Judy on a canopy walk. 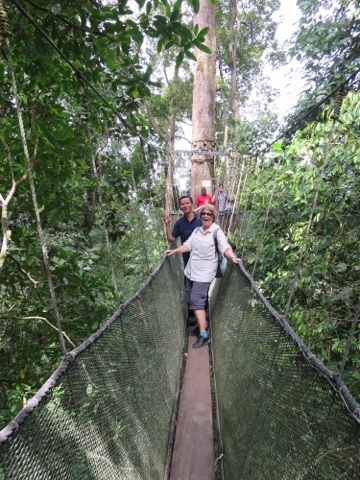 Much the same as crossing any swing bridge on a kiwi tramping track, except here you pay MR5 if you want to take a picture. 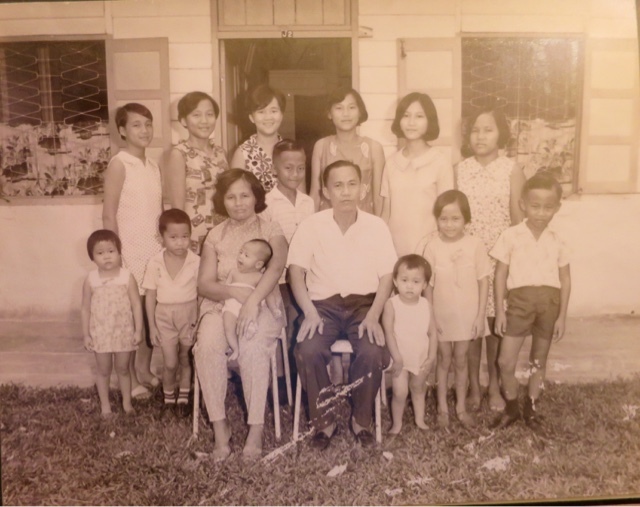 While we have been in KK I have had a birthday - my 66th. We went to the waterfront for dinner. It was one of those beautiful tropical nights, a Somerset Maugham moment, with the slightest of cooling breezes and lights flickering in the soft darkness from the fishing boats at anchor. It was a pity the Filipino waiter didn't know how to pour beer, and forgot the order for the next table. We felt sorry for him, he was just a kid far from home and trying his best. But the manager was on to him and he wasn't going to last long. We left him a decent tip. It was the least we could do considering all the kindness we have been shown. 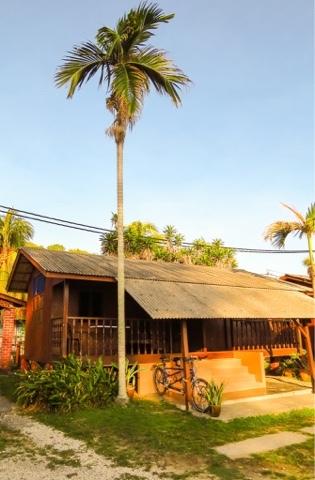 Sipitang, Sabah, east Malaysia. The sun sank behind 27 oil tankers and several oil rigs. Current Location: Lawas, Sarawak, Eastern Malaysia. Distance this trip: 625 km. 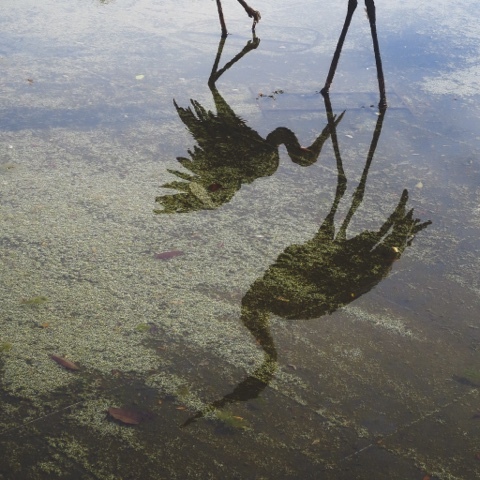 Weather: 32 degrees C, humidity 70%+. 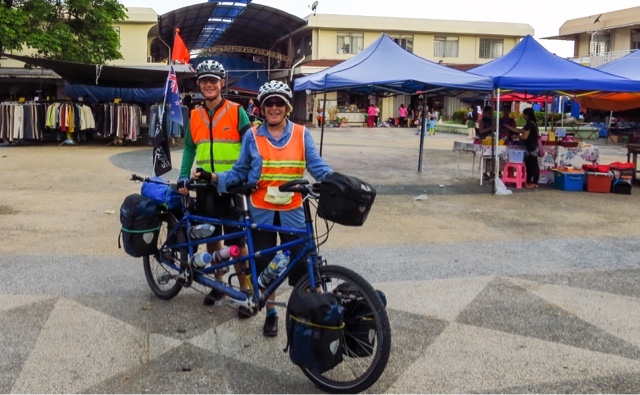 As a couple of cyclists who enjoy our food, we thought we might starve while cycling in Malaysia during the month of Ramadan - when good Muslims fast from sunrise to sunset. No problems, our KL friends assured us. 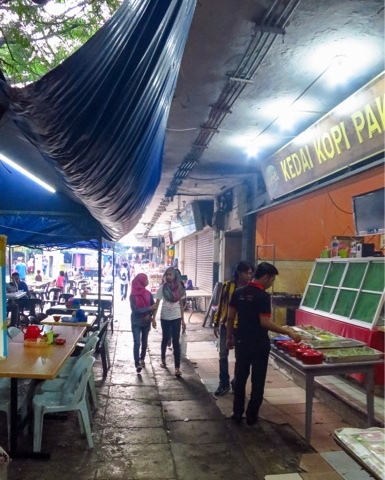 There will always be Chinese restaurants open and anyway, people are a bit more relaxed about Ramadan in Sarawak, in Eastern Malaysia - our starting point for this ride. 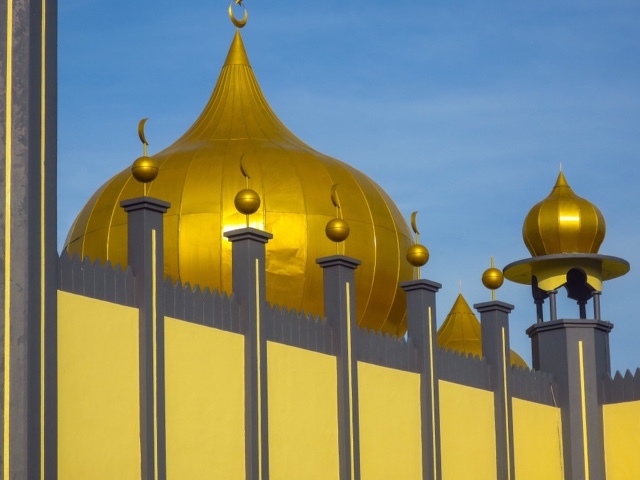 Our friends were right, but we forgot to ask them about Brunei - the oil-rich Sultanate which describes itself as a "Malay Islamic Monarchy" and takes its religion seriously. 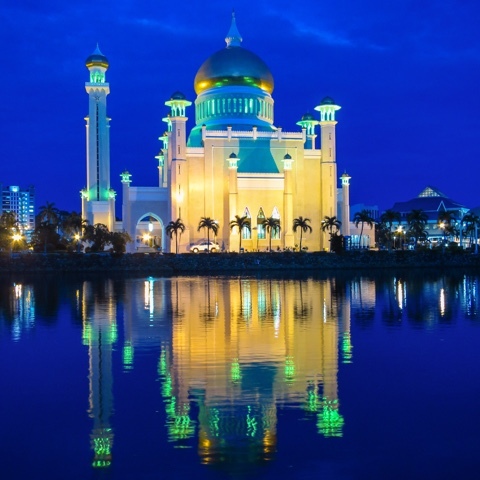 Masjid Omar Ali Saifuddien Mosque in Brunei's capital is stunningly beautiful at night. 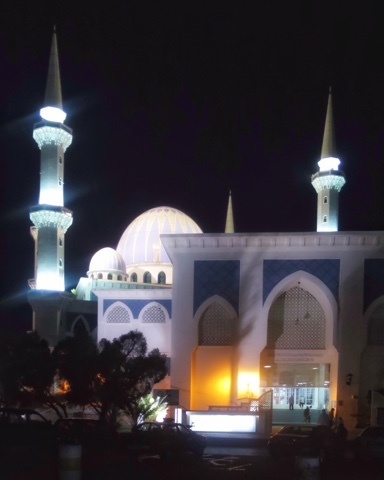 A sign on the gate politely said that during Ramadan it was closed to non-Muslims. A pity. We would have loved to look inside. 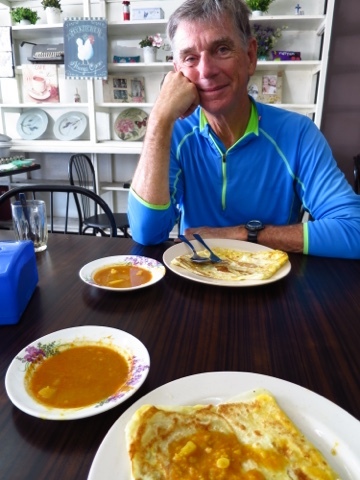 After a couple of weeks in Sarawak we crossed the border into Brunei and the next morning went looking for breakfast. The first restaurant we saw refused to serve us, but we managed to find a place selling takeaways. We bought Nasi lemur (chicken, rice, sambal, anchovies, peanuts and cucumber) and went back to our hotel room feeling a bit guilty, but not guilty enough to stop us scoffing the lot. 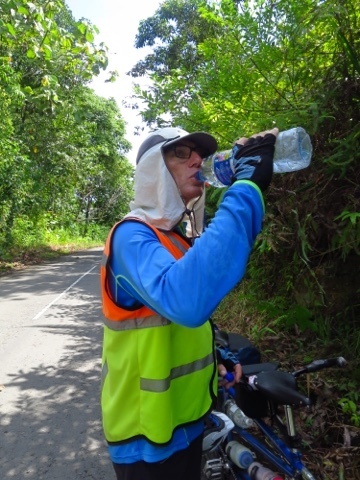 Glug, glug, glugging on a quiet backroad in Brunei. 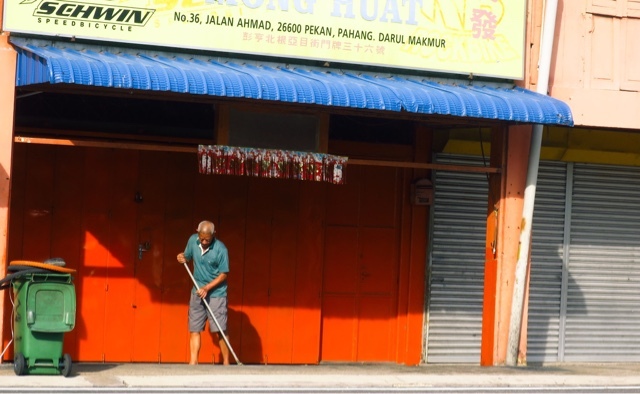 Syariah Court have been toughened up so anyone caught breaking them can by fined 4,000 Bruneian dollars (BND$), which is about the same in NZ dollars. Oh, and you can go to jail for a year as well. Doesn't matter what religion you are. This may not sound a big deal, but just try riding a bike in 32 degree temperatures for 30 km or so. Chances are you are going to want a big glug out of the five litres of water stashed in plastic bottles on the bike's frame. It's tempting, too tempting. 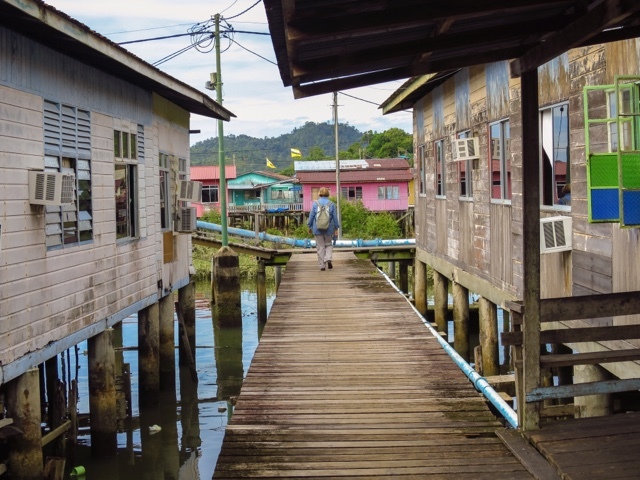 We visited Kampung Ayer in Brunei's Bandar Seri Begawan, said to be the biggest water village in the world, housing 20,000 people. Not many of them were around. We went unescorted, but we saw tour guides knocking fruitlessly on doors having promised tourists they would share a cup of tea with the occupants. 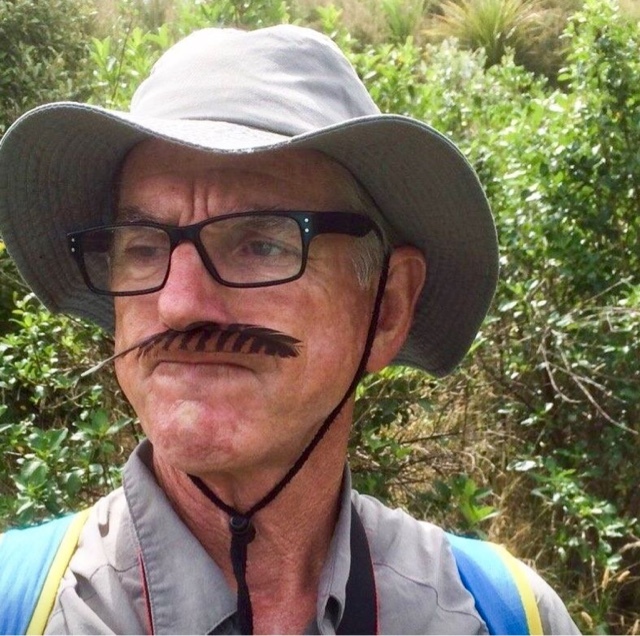 We felt strangely uncomfortable about the whole thing, like bringing in international tourists from Auckland airport and inviting them into people's homes in Ponsonby. We have taken to pulling off the road and gauging the gaps in the traffic so we can grab our water bottles, take a slurp from them and then put them away before the next car. It's not just the Syariah Court that worries us. We strongly believe that as visitors to other countries we should abide by their rules, whether we like them or not. But sometimes it's not easy. 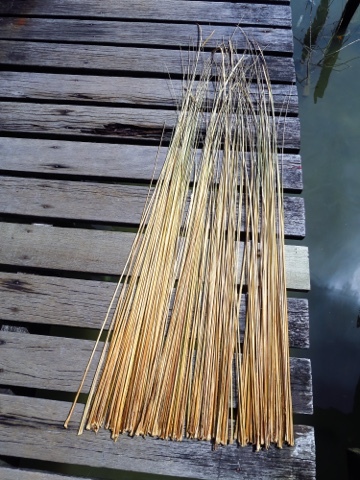 Basket weaving materials, Kampung Ayer. The other day we spotted a rural roadside restaurant and bought a couple of cans of coconut juice, hoping we might be able to bend the rules and sit down to drink them in such a quiet place. But it was a no, so we cycled down the road 200 metres and stood behind a tree - our backs turned to the stream of traffic. Judy was feeling peckish as well, so pulled a couple of spring rolls out of a pannier and hid them in her cap, eating them surreptitiously. 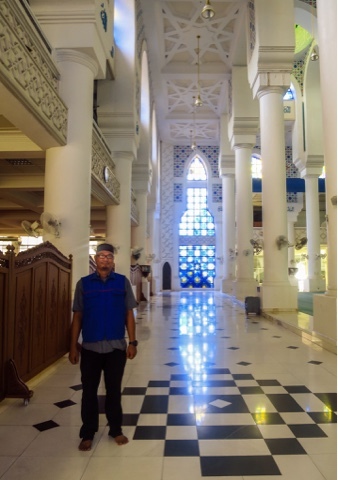 We rode into Brunei's capital, Bandar Seri Begawan, gasping for water. We stood on the Esplanade, baking in the heat. Only a couple of people around, so we did some quick glug glugging and got away with it. 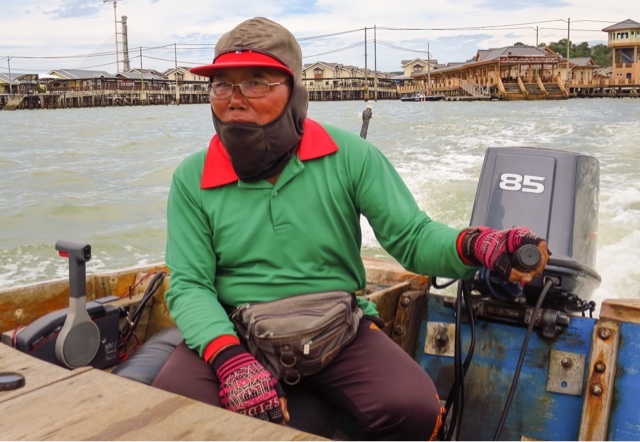 Boatman, Bandar Seri Begawan. Need a fast ride across the river? He's your man. 85 horsepower on the back and not a life jacket to be seen. Things improved at our hotel in Bandar. For an extra BND$5 each, they served us a western style breakfast of scrambled eggs, baked beans, sausages and toast. Perfect. We went sightseeing on full stomachs but left our drink bottles behind, knowing they were likely to be a problem. We have met some delightful people along the way. 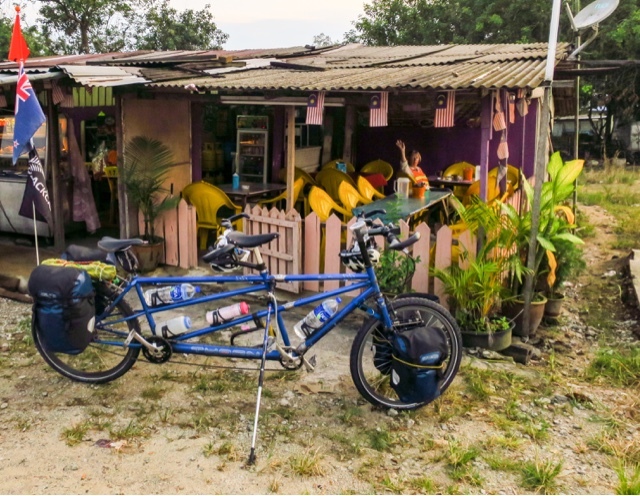 This couple own the Brooke Inn, where we stayed in Miri, Sarawak. We hope we will see them when they visit NZ next year. 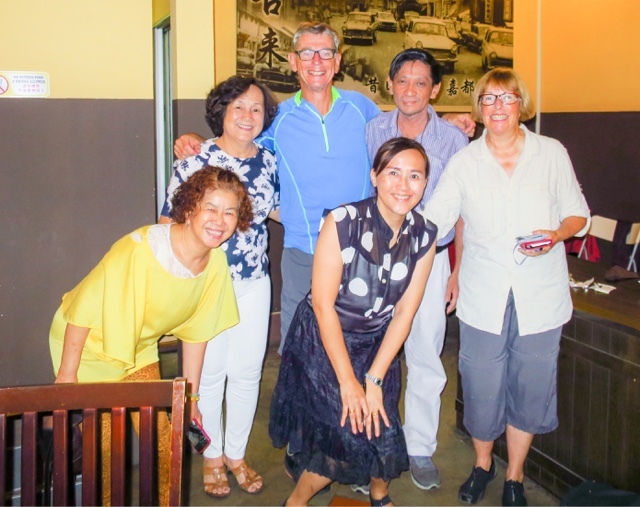 This group from Guangzhou, China, were on a package tour and staying at our hotel in Bandar Seri Begawan. They spotted the bike as we were about to leave and were fascinated. One of them insisted on draping the flag over the handlebars, but we don't know its significance. 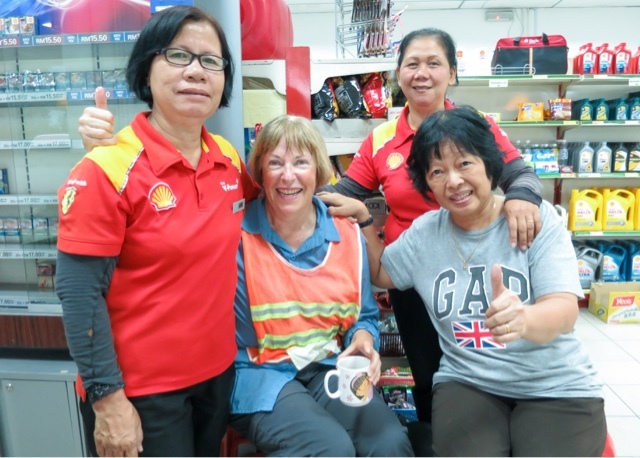 These women offered us shelter inside a Shell service station while we waited four hours for the rain to stop. They fed us coffee and biscuits and sent us on our way with small gifts of drinks and more food. 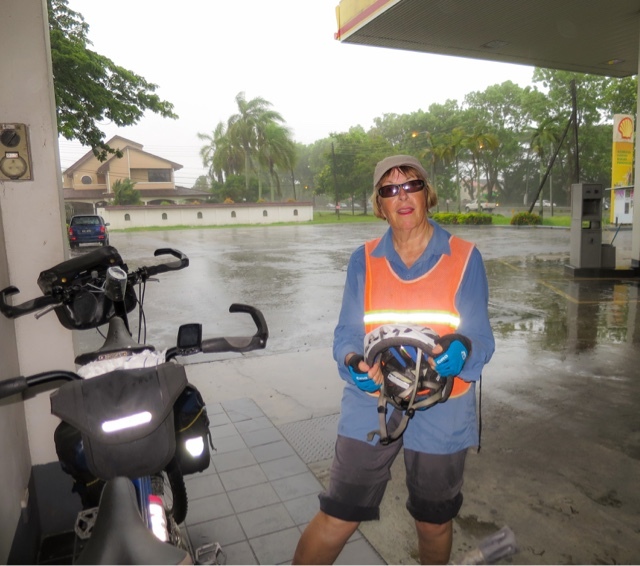 Judy waiting out the rain on the outskirts of Miri. We have had very little rain, but when we have it's been heavy and too dangerous to ride. 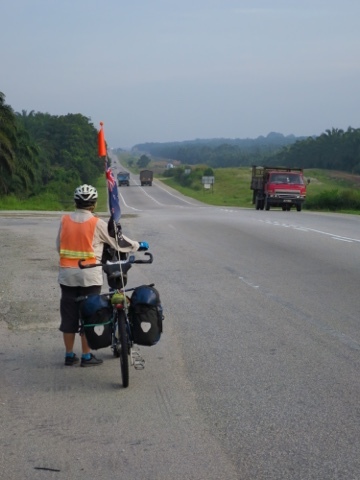 This afternoon we cycled out of Brunei and back into the Malaysian state of Sarawak. I was promising myself a beer at the first Chinese restaurant we spotted. 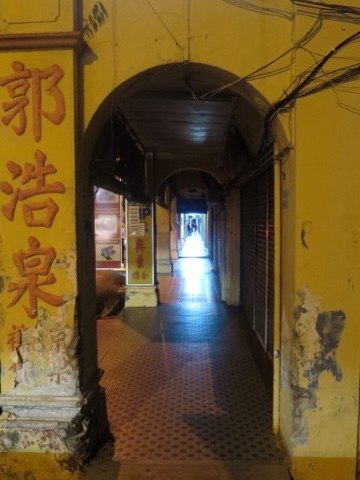 But Limbang seems to be a dry town, almost as dry as Brunei. No sign of beer anywhere. 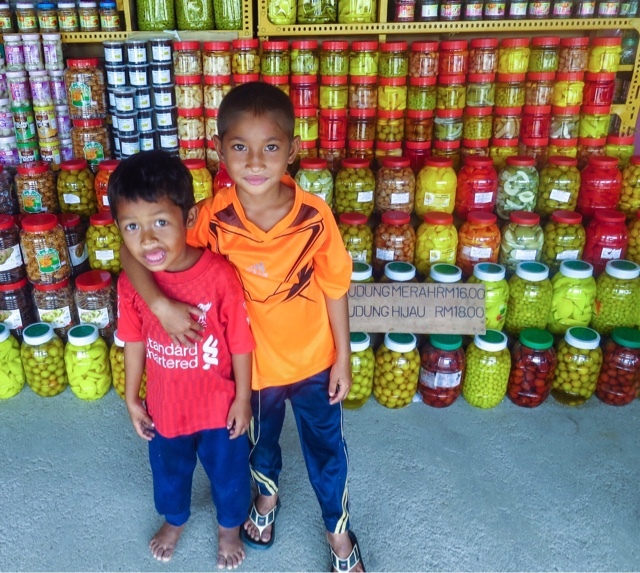 One local I asked pointed to the market and said I could get smuggled beer there, but I would probably have to buy a box, and he indicated a size big enough to hold a couple of dozen cans. I wanted a beer (or maybe two) not a party, so have had to make do with (more) canned coconut juice. Sometimes it's tough being a cyclist. The Beast of Burden has been getting used to some pretty flash surroundings. 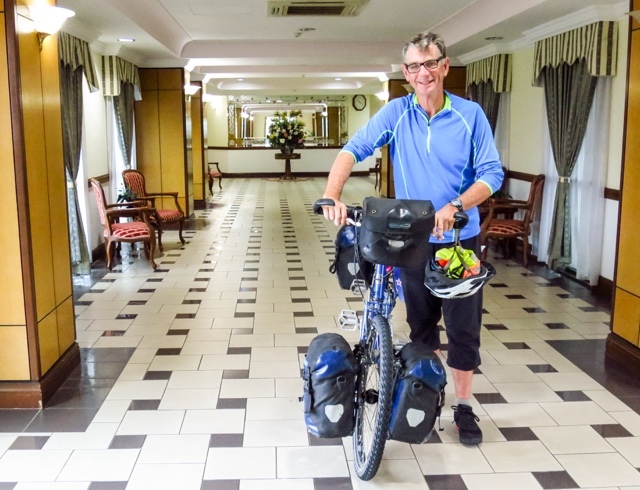 Here he is at the Halim Plaza Hotel, in Tutong, Brunei. Six floors up. 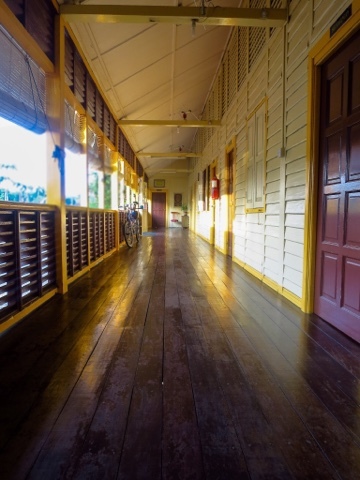 He had a carpeted corridor all to himself. 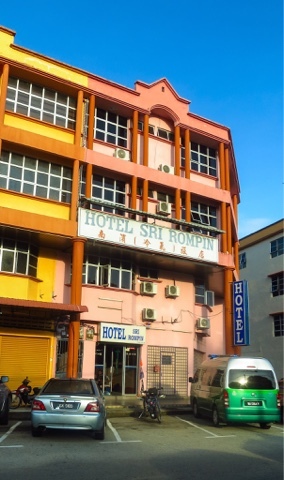 Feeling hot and sweaty while trying to negotiate a hotel room:"There I was trying to negotiate with four disinterested women, unaware my new fuchsia trimmed sports bra was leeching bright pink into my shirt." On being passed by the Sultan of Brunei's motorcade: "I just made eye contact with him. He was wearing a very striking outfit. (pause) Why wasn't I invited in for coffee? Maybe my wet weather overshoes weren't stylish enough." This afternoon we were stopped as we approached Lawas by three men in a van (one is taking the photo). 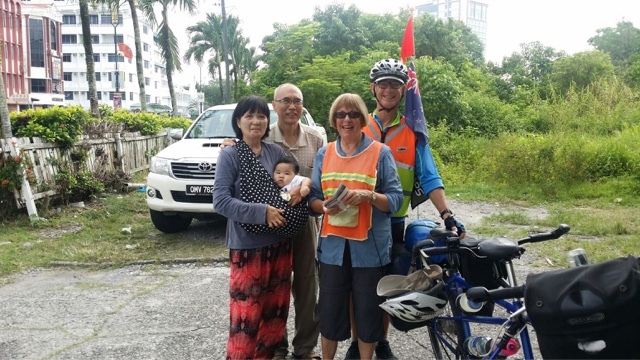 We met a cycling friend of theirs several days ago in Tutong, Brunei, and they knew to keep an eye open for us. They insisted on giving Judy a gift of a hi viz top, to keep us both safe on the bike. They are lovely guys and we wish them all the best with their own cycling adventures.